Welcome to my Monthly Freezer cooking and planning series. 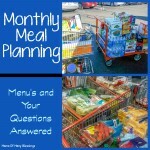 So far I have covered topics about planning as well as list making/shopping for a month. 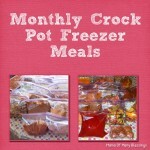 Today I am going to give you some tips for ways we make our freezer cooking day easier. I’m sure we will continue to learn more as time goes on, but after doing it years ago and doing it once again during this busy season in our lives these tips have been crutial for us to get all of our tasks accomplished. There are a few things we have learned to do before big cooking day. Trying to accomplish all of the monthly freezer cooking tasks in 1 day was not going to work. So we split the tasks up over 3 days before cooking day and then another day for cooking, this is a total of 4 days spent on completing all of our monthly freezer cooking. 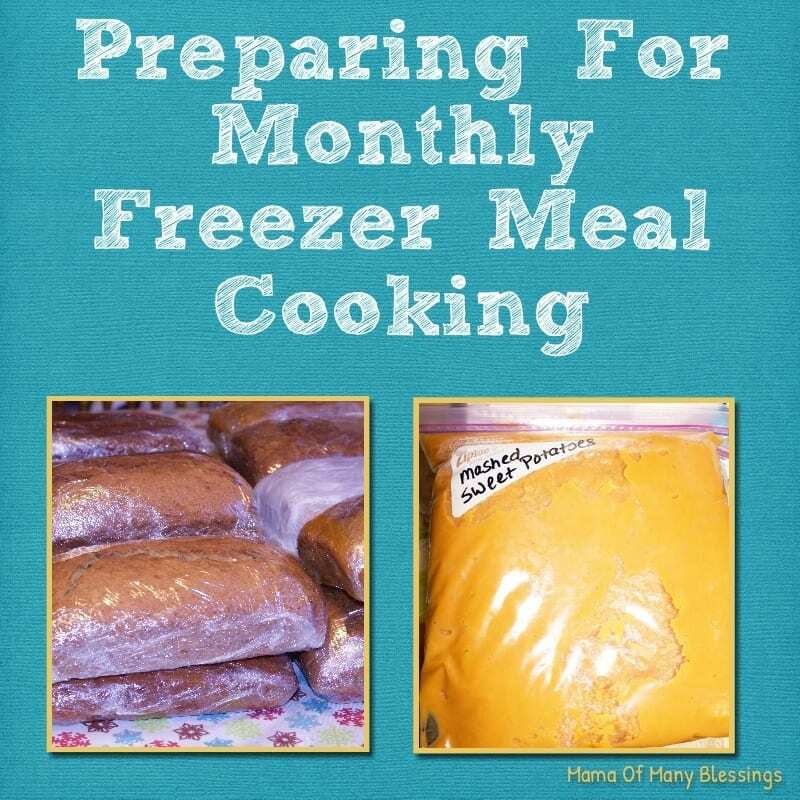 Part of the issue was that not only do we cook meals for the freezer for the entire month, I also get all of our bread made and many of our side dishes prepared and ready to go. 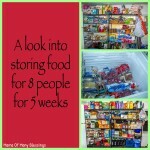 Trying to do this all in 1 day with how small our kitchen is just was not going to work out to well. Dustin is the bread maker in the house, he really likes the job because this means that he gets to clean the bowl out 😀 ! Either way it takes him most of the day to make 8 loves of bread. 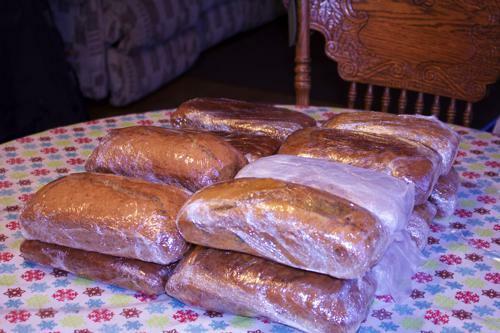 So the Tuesday before we freezer cook he makes 8 loaves of pumpkin bread or chocolate zucchini bread, and Wednesday he makes 8 loaves of banana bread. We use this recipe, but use raw honey instead of Splenda as the sweetener we really love this recipe because the sour cream inside helps keep the bread very moist even after it has been in the freezer. That may seem like a lot, but let me tell you with how many people eat in our house 1 loaf can be gone in an hour. 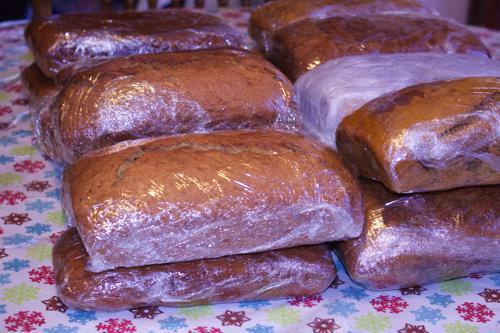 We get out 2 loaves of each a week and that will be the kids snack if they choose. 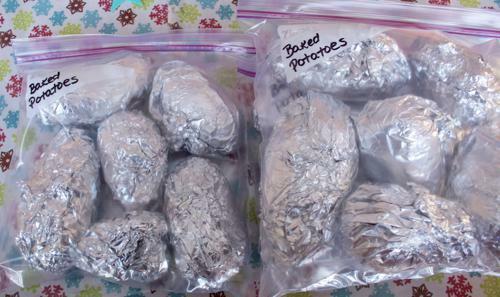 We cut and individually wrap potatoes and sweet potatoes store them in the freezer so they are all ready to go when we pull out food to thaw for dinner. 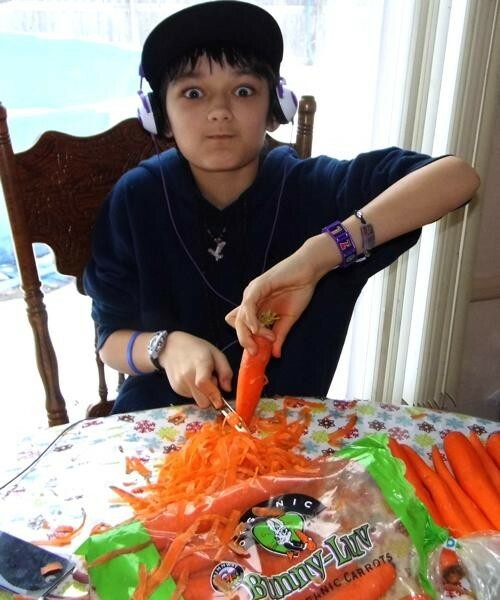 We also cut carrots and have enough for a meal stored in bags as well. 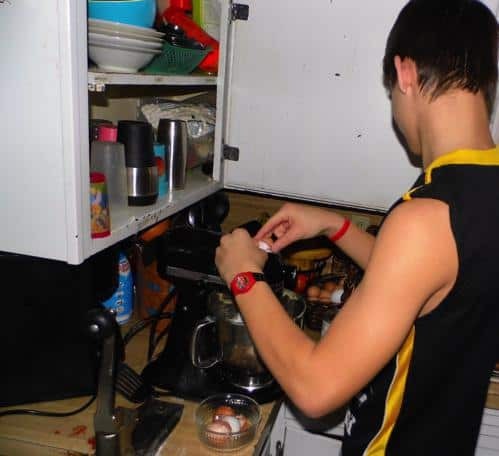 Yes this may seem like an easy task to do before dinner, but we just don’t have the time during dinner most nights even to do simple tasks like these. 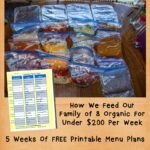 Having them prepared ahead of time for me helps ensure first off I don’t waste as much food, and second off that we are eating a bigger variety of veggies at dinner time. 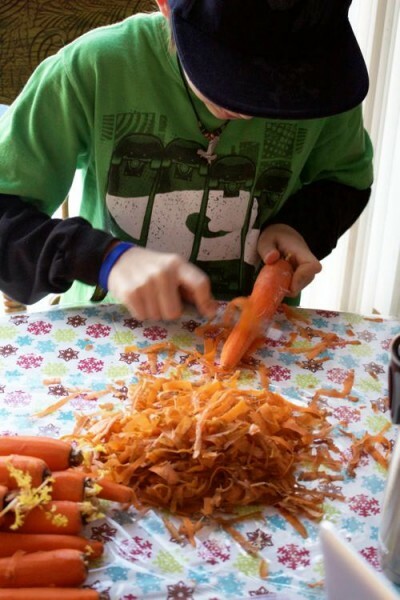 Cody is our carrot peeler, he usually peels 15lbs of carrots during our monthly freezer cooking week. He does 10lbs before freezer cooking day, and another 5 lbs on cooking day to go in our monthly meals. Teenagers are great for giving the camera wonderful looks lol 😉 ! 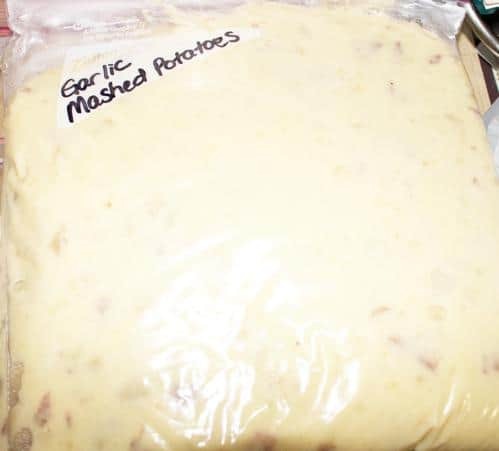 We also make big Batches of garlic mashed potatoes and mashed sweet potatoes, let them cool, put them in freezer ziploc bags, and then put them in the freezer. 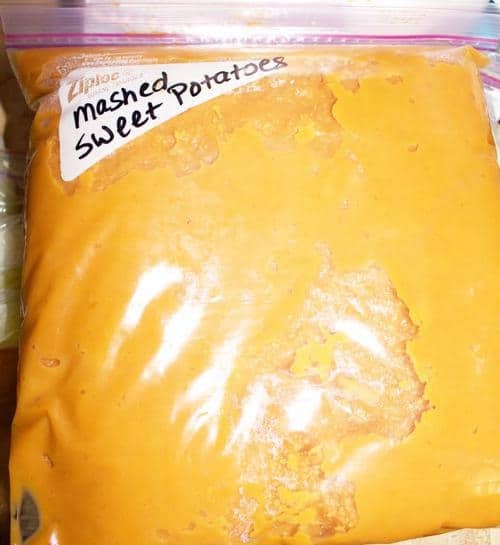 We use 20lbs of mashed potatoes and 10lbs of sweet potatoes for our meals for the entire month. Label bags with recipe names. 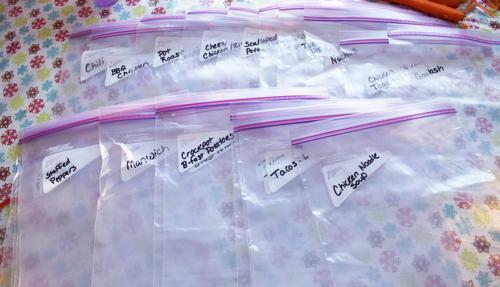 Getting the bags labeled before cooking day makes things so much easier on cooking day. 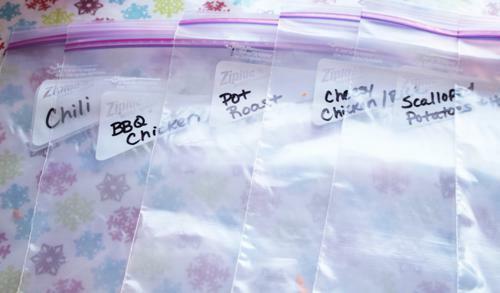 There are usually a couple bags I have to pull out on cooking day, but labeling bags after the food is in them can lead to confusion as well as make them pretty hard to label. 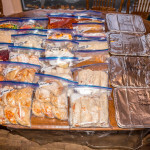 That is a look at the things we do before our big freezer cooking day, doing these things ahead of time is a huge help when it comes to our monthly freezer cooking! 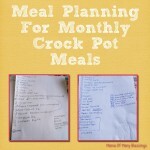 Tomorrow I will be sharing what our big cooking day looks like. Everyone helps out in some way in order for it to work smoothly. If you have any questions please leave a comment below, I will be answering questions on the last day of the series. 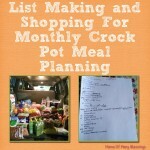 I am linking up with these great linky parties, stop over for other great ideas for your family. 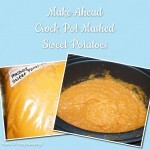 I would love the recipe to your garlic mashed potatoes and sweet potatoes! I will make sure to get those up first for you! 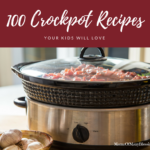 I will be getting recipes posted this week, there are a lot of them to share! 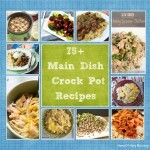 Yes I’d like those recipes too please! 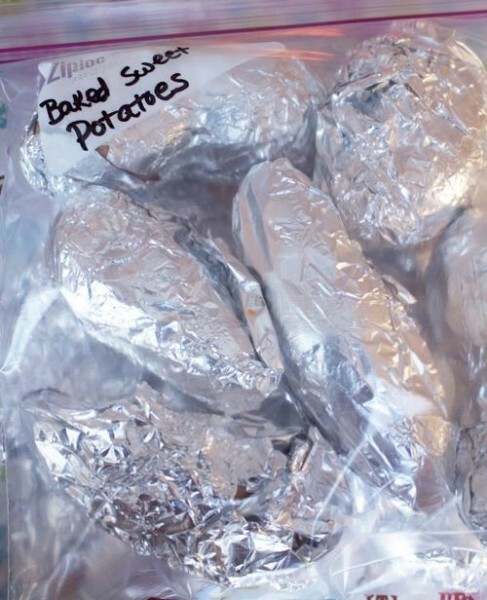 Also can you tell me – when you qrap your potatoes and sweet potatoes in tinfoil to bake – are they precooked? Sorry! Another questuon. 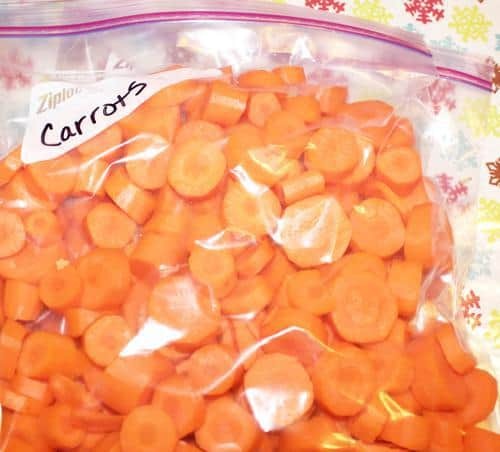 Do you precook the bags of carrots you freeze too? So nothing is precooked as far as the frozen vegetables are converned. The mashed potatoes are but not the carrots, baked potatoes or sweet potatoes. I wrap them individually just so that they can easily go from the freezer right into the oven to make things super easy.